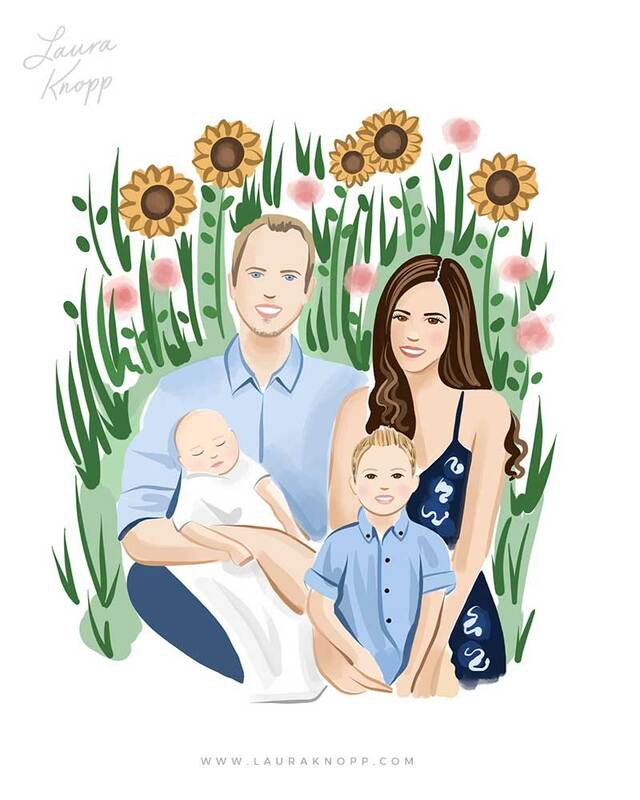 Like the portrait I created for Cassie - she wanted me to draw it using a photo of her family in a sunflower field (see below). Only problem? That photo was taken before her youngest son, Bennett, was born and she wanted her custom family portrait to include both of her kiddos. So, I asked her for photos of (1.) Her second son, Bennett, so that I could add him to the portrait and (2.) Her first son, Lucas, at his current toddler age since that first photo was taken when he was still a baby. Then, I saw a family photo that she posted on her Instagram page and I used that as a reference for their poses. Interested in having me combine photos for your custom family portrait? I can work from separate photos to add people/pets and to change facial expressions, clothing choices, hairstyles, etc. Send clear, high-quality color photos. They don’t have to be professional photos, they can be taken on your phone. I just need to be able to zoom in and see all the details so that I can draw them accurately. If you would like me to add people and/or pets, please send photos of them in the pose you would like them to be drawn in in your portrait. If you have specific questions about combining your photos, feel free to contact me over on Etsy. You can commission your very own custom portrait here!